Have you noticed the trend, even in realtor-headshots (in my mind the most corporate looking group who are still trying to look friendly) are becoming more lifestyle oriented. In other words, where they used to be photographed on a trust-me-blue background with flat lighting, now the trend is to be outdoors, doing something and not showing an awareness of the camera. The laughing-in-the-sunshine, tying-a-shild’s-shoes photos are on trend. 1. Where is my happy place? 2. Where do I feel energized? 3. Where do I feel at peace? For me, my happy place is my deck chair on my deck. Usually, I have a book on my lap and a pile of reading beside me. I might have a glass of wine on the table and it will probably be late afternoon. This is Henry in his “Happy Place”. 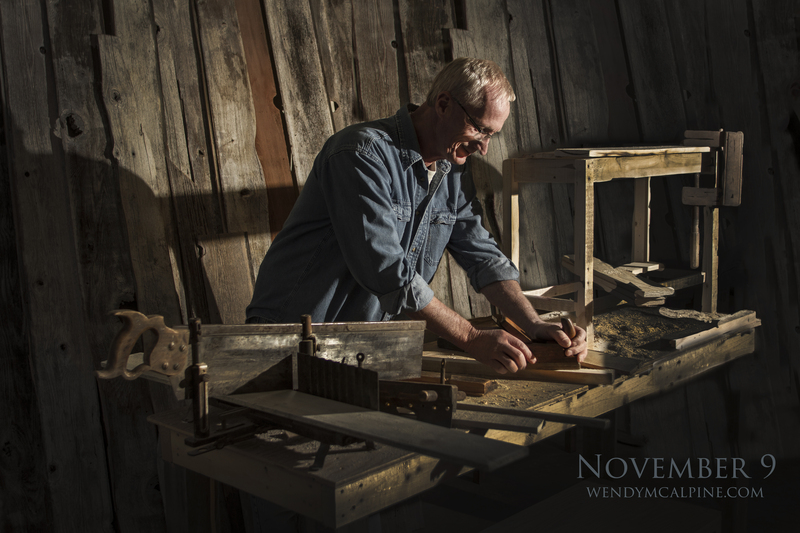 He is a woodworker and creates amazing furniture and frames from reclaimed wood. I feel energized walking or playing with my dog, Eva. It could be one of the paths in Mission Creek Greenway or hiking up on Knox Mountain. I would want the camera dog height with me being sort of an extra, maybe not even in great focus. I would love this image. 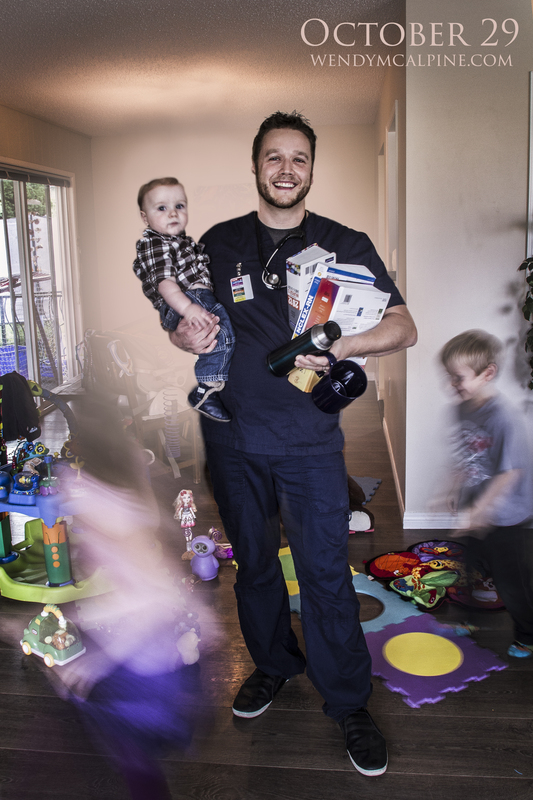 Matt was about to graduate from nursing school and he has a very busy household. This location was his idea but I asked him to mess it up with kids’ toys and laundry to exaggerate the activity in his life. My most peaceful place is Kasugai Garden, downtown, near City Hall. There is a particular bench that I love and I would go there and try to get a balanced image: Wes-Anderson-style symmetry, with me right in the middle. I would be looking directly into the camera and smiling slightly. This is Jordan who loves to dance and loves to read. This is her most peaceful place. She asked me about a year ago if she could do a portrait in this location. She loves everything about it – the scent of the paper and bindery, the subdued light and silence. For you, think of a place that carries the type of emotion that you want in your portrait. Something that will be say something to you whenever you see it. “I am a happy person and I like to read” or “I am a fun, active person and I like my dog” or “I am a peaceful person and my life is in control” – what is your message? Where is your dream location?